There are many considerations that need to be taken into account for this client including heart health, bone density, sedentary lifestyle, and age. Before anything, due to her risk factors, she needs to provide physician clearance for her to engage in an exercise program so that liability is reduced for both the trainer and the health club. You should explain to her the benefits of a specialized exercise regimen for reducing her risk factors as well as helping her achieve her other goals. Her initial assessment will obviously need to determine her base level of strength, muscular endurance, cardiovascular endurance, balance/stability, and realistic goals / progressions. Also, I think she should be told to schedule three training sessions per week and avoid exercising on her own at least initially because that would be unsupervised and therefore potentially dangerous. As she improves her health and fitness over time, she can start doing more workouts on her own. Her BMI is extremely high (and it’s obviously not due to a large amount of muscle mass) which correlates with a much higher risk in heart disease, hypertension (high blood pressure), Type II Diabetes, and many other major medical conditions. If she is pushed too hard physically in a workout, especially initially before her body can positively adapt, she could risk having a stroke or heart attack. When you check her blood pressure and heart rate, you need to keep in mind that she is currently on medication which will significantly change her numbers while perceived level of exertion may also be affected (often times heart rate will be low or moderate but the client feels that they are working extremely hard, so they need to be kept at a lower heart rate level than a normal client). Because of her low fitness level and high risk factors, her heart rate should not be elevated higher than about 50-60% of her maximum heart rate, possibly even less initially. Because she is well over 40 years old, her risk of osteoporosis is increased and she may be at risk for a fracture, especially in the leg or hip bones. Since she has been sedentary for 2 years, she has not been building up her bone density through weight-bearing exercises. Her excess bodyweight will also be putting her bones under more stress during nearly every movement and position she is in. Because of her questionable bone and joint integrity, quick explosive movements should be contraindicated for the foreseeable future. This woman’s balance and stability may be relatively poor so her proprioception needs to be evaluated and taken into consideration when taking her through her workouts. She will need extra close attention and spotting throughout her evaluation and workouts to make sure she does not fall or lose her balance and will need to start off doing simple exercises, always with light weight. Some Nautilius-type machines might be preferable at first over free weight exercises because they will target the muscles while stabilizing the body. Intensity: Low Intensity due to risk factors and health/fitness level (may progress to low-moderate intensity over time as risk factors have been evaluated and health/fitness levels improve). Type: I would opt for a mixture of weight-bearing (treadmill walking, potentially elliptical after achieving a solid base of strength, endurance, and coordination) and non-weight-bearing cardio (recumbent bike and/or upper body elliptical if available) to get bone density increasing benefits without risking overuse. Time: About 20-30 minutes 3 times per week. I know the American Heart Association recommends a little bit more but initially she will not want to risk overuse. I’d say closer to the 20 minute mark initially, and then progress to the 30 minute mark over a period of weeks. Frequency: 2 Times Per Week (at least initially). Potentially progress to 3 times per week after 4-8 weeks. Conditioning Type: I would recommend light weights at around 12-15 repetitions per set, with excellent form, and about 1-2 minutes between exercises depending on difficulty of exercise. I would intersperse stretches between exercise sets to keep. As she gets in better shape, intersperse some light-moderate cardiovascular intervals in between resistance training sets to keep heart rate up and improve metabolism and cardiovascular health benefits. Time: 30-45 Minutes 2 times per week. Type: Active Range of Motion and Static Stretching. Possibly some assisted passive range of motion with trainer if some muscle groups are extremely tight or shortened. Massage therapy, acupuncture, and/or acupressure would also probably be beneficial if possible. No ballistic stretching. 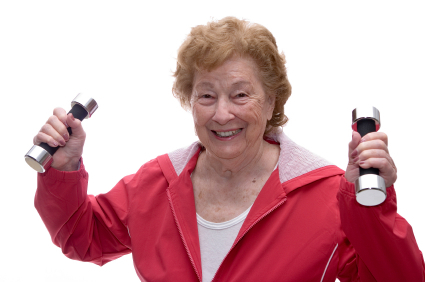 I hope this case study in senior citizen fitness has been helpful to you as a personal trainer or health care worker!